Manchester United finally returned to winning ways at Goodison Park on New Years Day when they beat Everton 2-0 after splendid goals from Anthony Martial and Jesse Lingard. The win followed three consecutive draws when United’s attack had been heavily criticised. In fairness, despite a good run of results until the derby defeat and those three draws during the festive period, United’s style of play had been criticised quite heavily. The performance at Everton was therefore very welcome given the entertaining football United played. 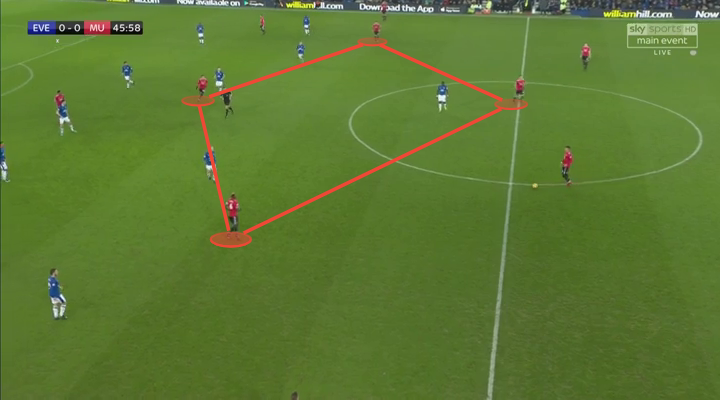 In this article I’ll take a closer look at United’s attacking setup at Goodison. Both teams fielded identical formations on paper which looked like 4-5-1 in defence and 4-3-3 in attack. Everton’s front three was Nikola Vlasic, Oumar Niasse and Yannick Bolasie. Wayne Rooney started in midfield next to Morgan Schneiderlin and Tom Davies. Former United player Michael Keane partnered Ashley Williams in central defence with Mason Holgate at right-back and Cuco Martina on the left. England’s potential World Cup number 1, Jordan Pickford, started in goal. In the absence of Antonio Valencia, Ashley Young and Romelu Lukaku, Mourinho chose Victor Nilsson Lindelöf at right-back and Luke Shaw at left-back with Phil Jones and Marcos Rojo in the centre in front of David De Gea. Jose Mourinho also introduced a third central midfield player with Ander Herrera joining Nemanja Matic and Paul Pogba. In-form Jesse Lingard started on the left, Juan Mata on the right while Anthony Martial got the nod to start as the centre-forward. It proved to be a great choice. Sam Allardyce’s side were extremely passive in their approach which made their positionally-oriented low-block ineffective. The key when defending low is to maintain aggressiveness when initiating their pressing. 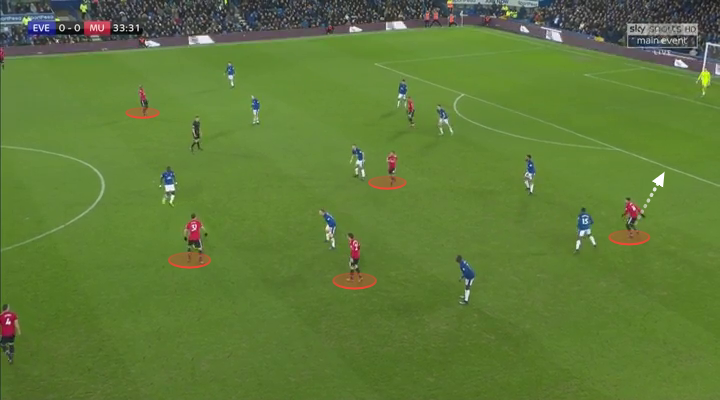 Everton were really passive though, and basically just stood in their positions. That’s stretching things a bit in truth, but even Allardyce himself complained at his players lack of bite after the game. This is an image of Everton’s defensive setup. If you check the time, just over a minute has been played. There was none of the infamous Goodison pressure early on, which has disturbed many United sides, but instead a passive acceptance that this was United’s game and Everton weren’t good enough to attack them. There is no problem with defending low of course, in fact it’s the reason Allardyce has managed to turn around Everton’s form, but when defending low and passive you’re inviting trouble which is what they got as United dominated. 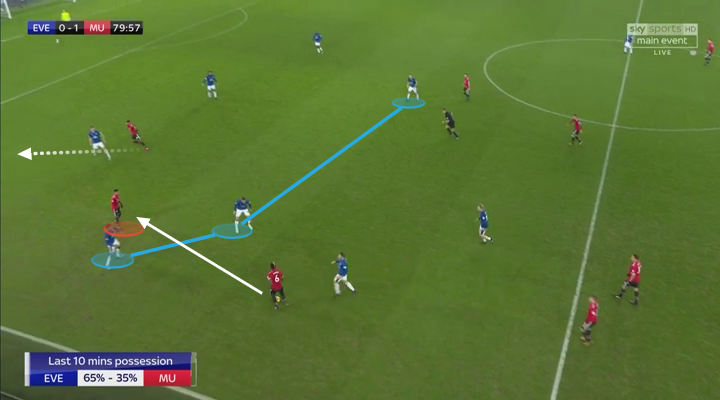 This example shows one of the issues with Everton’s deep approach; it forces their attacking players to defend dangerous areas. As I’ll come to, United’s attack was very fluid and they flooded the centre with players which meant Everton’s full-back were forced inside as they followed their man. This forced Bolasie and Vlasic to defend in full-backs positions and, given they’re not defenders, United could exploit their lack of defensive thinking to carve out openings in wide areas. Here, Pogba draws Vlasic in before playing a one-two with Lingard who has dragged Holgate centrally with his inverted movement. Pogba can then easily progress outside the full-back as Vlasic is slow to react to the situation. A few seconds later, Pogba’s low cross could have been turned in by Martial, but fortunately for Everton they weren’t punished here. It would have been intriguing to see how the game would have unfolded had Everton dared to press United. Now, they gave United the initiative, and a very good United on the night seized the opportunity. Jose Mourinho always have a powerful centre-forward in his teams. If it’s not Zlatan Ibrahimovic or Romelu Lukaku it’s Didier Drogba or Diego Costa. With Ibrahimovic and Lukaku injured though, this wasn’t an option. Mourinho opted for Martial rather than Rashford through the middle. Either side of the Frenchman, Lingard and Mata were deployed. While United defended in a conventional 4-5-1, there was nothing conventional regarding their attack. In fact, it was very different from what we’ve normally seen this season. First of all, with players like Shaw, Pogba, Lingard and Martial on the pitch, United had pace in their team, especially down the left side were those four predominantly played. The key in this game though was that pace combined with exceptional movement from the front three. I’ve written about Jesse Lingard’s intelligence and quality out of possession and I’ve done the same with Juan Mata, but Martial is also extremely good at dropping into spaces to receive or by attacking space in behind. When he plays wide this quality is rarely expressed, but when in the centre he can showcase all of his quality. One part of his game where he excels is dropping off from his central position and move towards the left to drag the closest centre-back into an uncomfortable wide area for a centre-back. As he runs in behind the right-back, Martial can often create a 1 vs 1 with the centre-back in which he’s devastating. 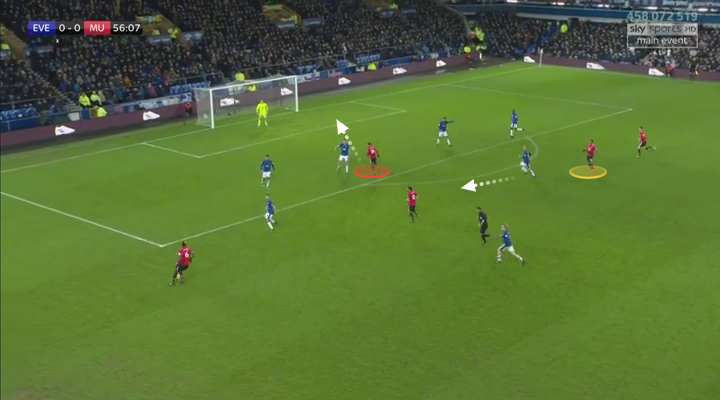 In the image I’ve highlighted his starting position in the centre, the one Lukaku would have stayed in, before moving outwards towards the left. This movement is one centre-backs will hate since they have to leave the comfort of their central area. Additionally, every centre-back would agree it’s much easier to defend a static striker with his back to goal then one who’s constantly moving and dragging you out of possession. In the example below, Martial has dropped off from Williams marking and overloaded the central midfield. Lingard has also moved inside at the top of the centre-circle. Williams stays in his position while Rooney can’t see Martial and Bolasie is too far wide, meaning Martial can pick the ball up, turn and attack the defensive line. Martial excelled with his movement, both in behind and when dropping off, which created many problems for Everton who were constantly outnumbered in the middle despite having three central midfielders. The defenders were often left without a direct opponent which cause confusion and gave United’s attackers time on the ball. Lingard and Mata once again highlighted their ability to move in and out of the opponents defensive block to pick the ball up and create problems. 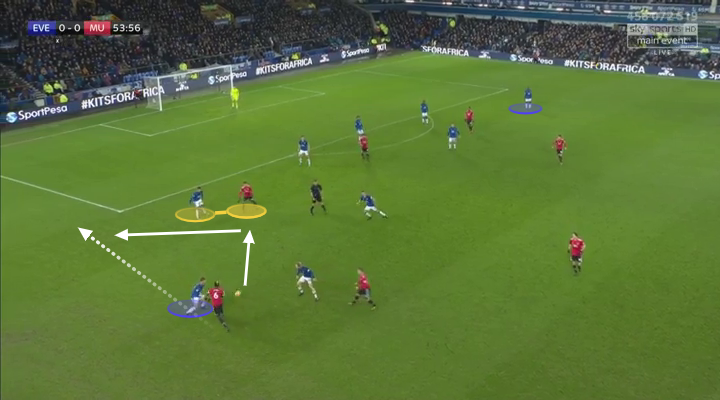 Below, Mata has drifted inside and found space in behind Everton’s midfield where five players get beaten by a single pass, as well as the two in front of the ball. 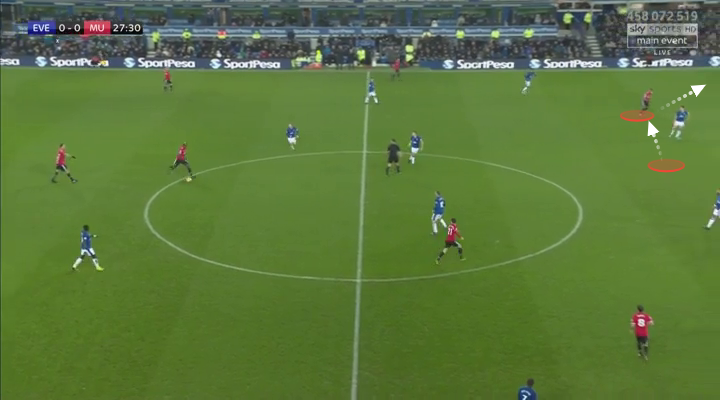 Here, Lingard has moved over to the right and is attacking the space in behind Everton’s defense. Mata has moved into the number ten space to create a situational midfield diamond to once again outnumber Everton’s central midfielders. Here it’s Lingard who moves into the number ten space to create a diamond in midfield with Mata pushed up on the right. Niasse often dropped in to help his midfield but he was always alone against three opponents when United built attacks so he didn’t really affect United’s play. Finally this image illustrates the problems Everton had. 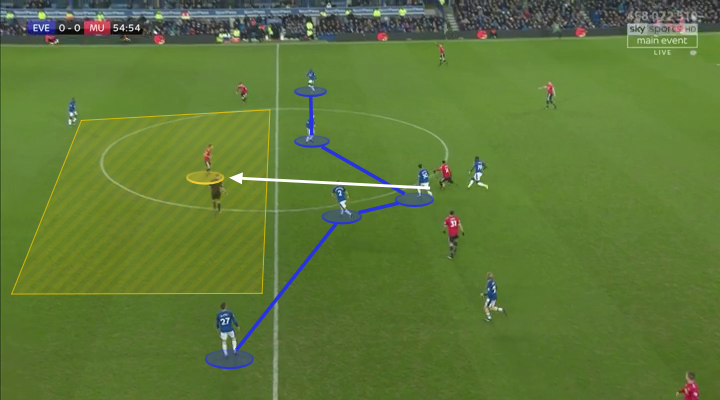 United’s deployment of several players between the lines, thanks to the fluid movement of Lingard, Mata and Martial, led to Everton having next to no pressing against Matic and Herrera who could dictate the passing. This meant Everton struggled to get near their opponents who could hurt them in different ways. The image shows Matic options to play the ball forward; he can give it to Pogba in the left half-space, Lingard can spin and attack in behind, Mata is an option in the ten space and Martial is dropping into the right half-space from where he can progress the attack. Together with Pogba’s line-breaking runs and dribbling and Shaw’s pace down the left, United’s front three were fluid and interchangeable which made them tough to defend against and entertaining to watch. It led to one of United’s best performances of the season and a dominant win. Anthony Martial opened the scoring in the game with a wonderful finish at the end of a superb counter-attack. After United won the ball just outside their own box, the ball was passed quickly to Juan Mata who carried it up the pitch before passing to Paul Pogba on the left in the scene you see below. Once again, the fluidity in United’s front three is evident. Lingard has made a diagonal run towards the centre from the left and is now attacking the space behind the defensive line. The centre forward Martial, however, has dropped off the front and is highlighted with a yellow circle just outside the box. His closest opponent, Wayne Rooney, is watching the ball and drawn towards the unmarked Mata. Martial opts to stay in his position, receives Pogba’s outside of the boot pass and curls a delightful finish out of Pickford’s reach. 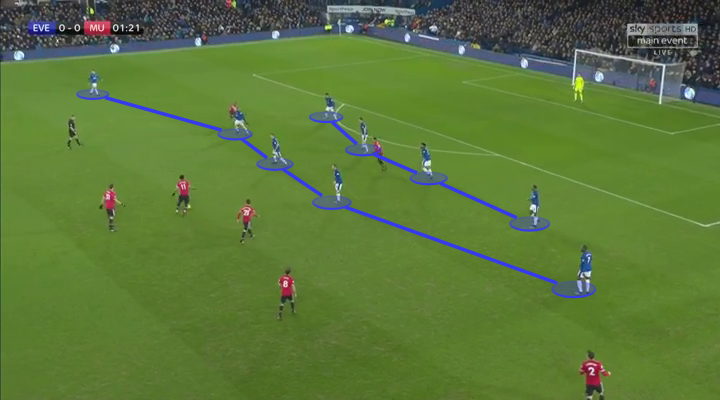 The second goal was also evidence of United’s fluidity up front as well as the way they utilised the space between Everton’s lines of midfield and defence as shown earlier. First, Pogba’s pass breaks the midfield line which Holgate is a part of after his poor throw in gave United the ball. Lingard has found space behind that line and is on the half-turn ready to go forward. As Lingard prepares to receive, Martial makes a run towards the left as I highlighted earlier. His action catches Keane’s attention which gives Lingard an extra fraction to get his speed going. Lingard then beats Keane, advances and curls the ball beautifully into the far corner. Manchester United earned a great win away at Everton and made one of their best performances of the season. Everton rarely threatened while United impressed in attack. It was welcome given the performances throughout the autumn. The question that lingers though is whether this was a player-driven or coach-driven performance? 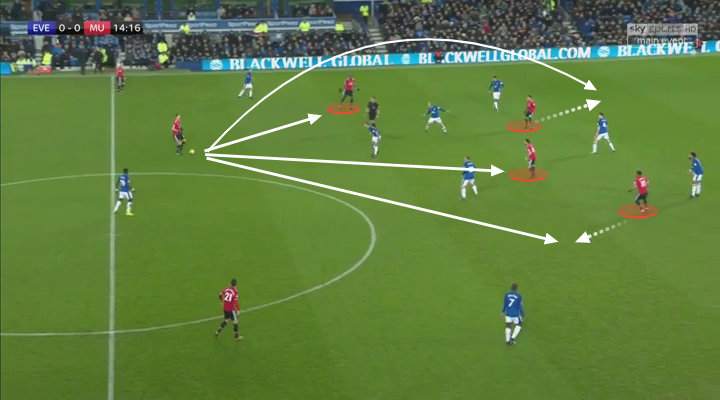 We’ve previously seen that Mourinho gives his attacking players a lot of freedom to create, as we saw with Lingard and Mata at Everton, but there has rarely been any form of structure in the way they attack. 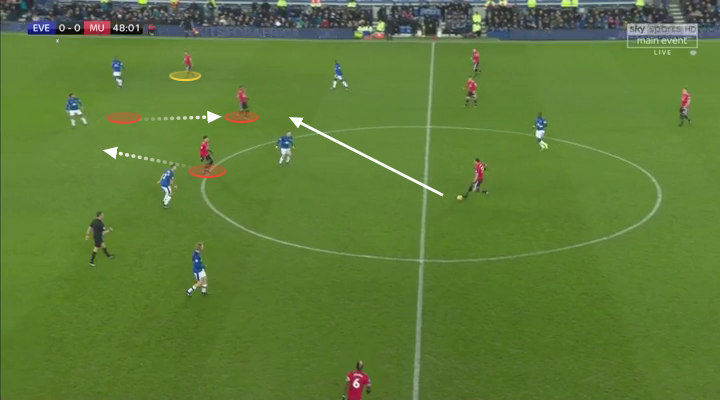 At Everton, the movement of the front three was the key to United’s win and their good attacking play. Did it happen because Mourinho had coached Martial, Lingard and Mata to find those areas or was it their intelligence and quality which made the performance so successful for United? I think it’s a compromise; freedom to move and create for the front three and Pogba but also Mourinho should have credit for putting Herrera into the side and allowing Pogba a freer role on the left of the midfield three which suits him best. The lack of the archetypal Mourinho-striker like Lukaku or Ibrahimovic gave United a more fluid and quicker attack, which worked well on the day and entertained the fans. Maybe Mourinho should look to try a new template in certain games, even when all his players are fit. In the end, it was a great win for United in a tough game, and Jose Mourinho should get credit for the way his team played and eventually won the game.